I scanned some old pictures of the kids today. Most of them were Halloween pictures that I’ll post later this afternoon. But I couldn’t resist these two. This first one was taken in October of 1996. 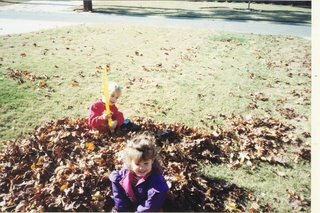 It was funny that I came across it right before Kristie talked about raking leaves. Taylor was four and Katie was about two. This other one was just a cute picture. Katie had gotten into Taylor’s shin guards and my Gumby slippers. Pretty intimidating, isn’t she? 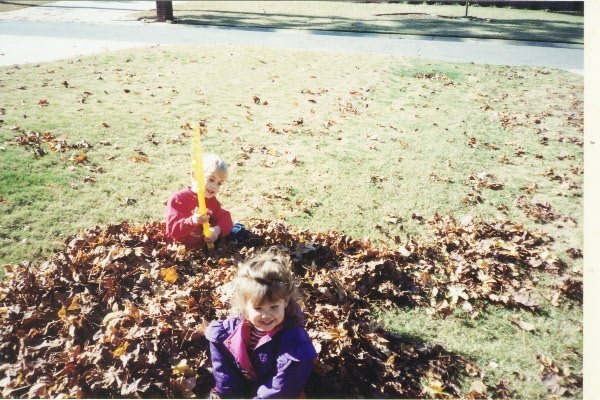 LOL I think this one was taken in September of 1997 – so she’s just almost three and Taylor is five. That’s all for now. I’ll post some of their old Halloween pictures later. Does nobody take me seriously??? We all know you too well to take you seriously! And, you need to post my favorite picture of your kids…. mowing the lawn with the umbrella. I used that as my wallpaper (until I got my grandbaby!). LOVE that pic!